Welcome to M&J Sign Company! 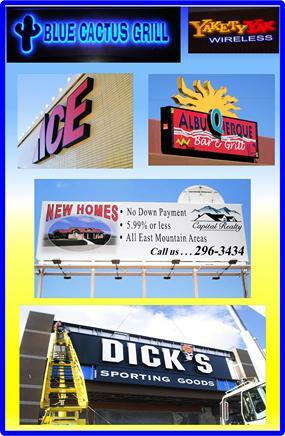 Established in 1974, we are a full-service New Mexico sign company. M&J has built a strong reputation for dependable and professional service by using quality materials and skilled craftsmanship. We design, manufacture, and install all types of exterior and interior, illuminated and non-illuminated signage. Our art & design department is state-of-the-art, and allows us to offer our clients the most up-to-date, technical designing and artwork available today. We are a large maker of specialty sign products, and offer an array of custom metal manufacturing capabilities. We handle all parts of the sign-making process, from design, permit acquisition, fabrication, to installation. We also specialize in refurbishment, de-branding, and on-site repairs. M&J Sign Company is your local preferred authorized dealer for LED Message Centers. At M&J, quality still matters; that is why we are an exclusive distributor of watchFire� LED Message Centers. They are the BEST in the industry, they have the best warranty, and they are engineered and manufactured here in the USA.